Pull Systems: authorize work releases based on system status. The driving force is the ship date. The shipping date drives the completion of the work. The target is 100% complete and 100% defect free ready to ship on the scheduled date. The production flow is controlled by each function reaching backwards and pulling the work forward. We schedule backwards to know what to release when to keep the flow smooth. This controls WIP and increases the velocity of movement on the factory floor. The faster the product moves through production the less it costs. Pull systems in the laboratory furniture business are Make To Order in which the production is based on actual demand. “Make To Order” (MTO). Inventory is kept to a minimum, products can be supplied with short lead times and at high speed. 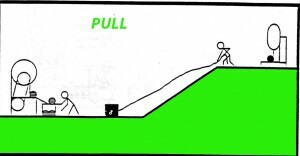 Many struggle to understand the differences between Push and Pull. At the point where “Pull type” starts to supply operations triggered by actual demand, it is like an elevator. An elevator starts when a button is pressed even if there is only one passenger. 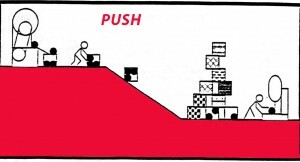 On the other hand, the “Push type” can be considered as an escalator. An escalator continues to supply (push) regardless of whether there is actual demand (passenger). The laboratory furniture industry is somewhat of a hybrid. While the common model is MTO, there are elements of mass customization and batch of one techniques. 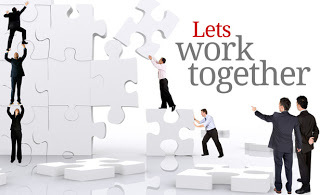 It is a combination of these methods that give us a lean factory that is responsive to market requirements. Creative Solutions can help you create a Pull system that will support 100% complete and 100% on-time performance.